I happened across one of my posts the other day written in October 2012, a little over five years ago when my blog was in its first year. I was writing about three fabric groupings in my stash that I was wild about even though I hadn’t yet decided yet what to make with them. What a pleasant surprise to discover that I have, in fact, used all three groupings! Several of the fabrics wound up in this sewing machine dust cover . . .
From this group came a small project, a kaleidoscopic table topper made in 2014 . . . These fabrics remained in my stash until 2017, when I used them to make my current Junior Billie Bag . . .
Now when I see a new group of fabrics I just can’t live without, I’ll remind myself that the fabric in my stash is indeed getting used. I’ll just need three additional lifetimes to sew my way through all of it. Can you relate? Among the many special exhibits at last week’s Northwest Quilting Expo (held in Portland, Oregon) was a small one called “Reach for the Stars” featuring quilts made using Minnesota quilter Terri Krysan’s design of the same name. The quilts were made by Portland quilters who had seen my version on display at the Pine Needle and wanted to make their own. The owners of the quilt graciously loaned it to Lana so it could be part of the special exhibit. You can see some of the lovely motifs that longarmer Kazumi Peterson used. Left to right: Sharon Schaper, Sharon Ripley, Joie Lattz, Maxine Borosund, Dawn White, and Lana Kamerer. With us in spirit: Andrea Hinderhofer. You’re looking at the center medallion and first five blocks of Annette Holder’s Reach for the Stars quilt. Annette lives in Jonesboro, Arkansas. We met online as part of a community of quilters making the dazzling sampler quilt designed by Terri Krysan that was featured as a series quilt in Quilter’s Newsletter magazine during 2013 and 2014. Annette named her quilt Oh My Stars. If you’d like to see other versions of this stunning quilt design, take a look at my Reach for the Stars page on Pinterest. If you’ve made your own version, I would love to hear from you! You can email me at dawn (at) firstlightdesigns (dot) com. I’m excited to share pictures of four more versions of Reach for the Stars, Terri Krysan’s stunning star sampler quilt that was featured in Quilter’s Newsletter magazine three years ago. By writing about the construction of Catch a Falling Star, my own version, on this blog throughout 2014 and into 2015, I became acquainted with other Reach for the Stars quiltmakers locally and from as far away as Australia. Lana made this quilt as a raffle item for her grandson’s school. The winning bid came in at $2,000! I know how much time, effort, and money went into the making of that beautiful quilt. What a generous heart Lana has! If I had made that quilt, it would have been very difficult for me to part with it. Doesn’t her multicolored checkerboard border make you think of harlequins, those colorful characters from Italian commedia dell’arte dressed in checkered costumes? Sharon’s border ties all of the colors in the individual blocks together in a bold and innovative way. I’ll continue to publish photos as more of my friends from near and far finish their versions of Reach for the Stars, so please stop by from time to time. If you type in “reach for the stars” in the SEARCH ME box on the right side of my home page, you will be taken to all of my RFTS posts in chronological order. Reach for the Stars, the spectacular sampler quilt designed and made in 2012 by Terri Krysan of Lakeville, Minnesota, continues to enchant quilters all over the world. Terri’s quilt was pictured on the cover of the Oct./Nov. 2013 issue of Quilter’s Newsletter. My guess is that hundreds, if not thousands, of versions have been made — or at least started — since then. Directions for the quilt were presented in a series beginning with that issue of Quilter’s Newsletter and ending with the Oct./Nov. 2014 issue. My version, named Catch a Falling Star, was completed early in 2015. During the year I spent making my quilt, I became part of an on-line community of Reach for the Stars makers that continues to this day. Beautiful, Annette! I can’t wait to see it quilted. This is a stunning achievement, given that Judi is a relatively new quiltmaker. Chris Tabuteau of Melbourne, Australia is also a beginning quilter. She, too, created a fabulous version of Reach for the Stars. Chris bought a set of 40 Barbara Brackman Richmond Reds fabrics “on a bit of whim,” as she recalls. She thought a sampler quilt would allow her to use most of the fabrics and develop some sewing skills. Chris also pieced a lovely back, a finished quilt in itself . . . Thank you, Annette, Judi, and Chris, for sharing your beautiful creations! The first day of 2016 is here! It’s a time for looking ahead but also a time for looking back. Specifically, looking back at what I accomplished in my sewing room in 2015. I never accomplish as much as I think I will, especially when it comes to finished quilts, but I have to remember that I made a variety of small pieces and craft items last year in addition to quilts. It will be fun to revisit them as well. Catch a Falling Star (84″ x 105″) was quilted by Loretta Orsborn of Orsborn Specialty Quilting. Billie’s Star was quilted by Nancy Stovall of Just Quilting. Next came Simply Dashing (58″ x 74″), a simple design that combines 4-Patch Wonder blocks (my name for four-patch kaleidoscope blocks) and Churn Dash blocks set on point. Simply Dashing was featured on the cover of the Pine Needle Quilt Shop’s fall 2015 catalog. Quilted by Debbie Scroggy of All Quilted LLC. I quilted the last two pieces myself but was happy to have the larger quilts go out to some extremely talented longarm quilters. In my next post I’ll show you the array of Pretty Little Things I made in 2015. Catch a Falling Star, my quilt pictured above, hung in the Northwest Quilting Expo show in Portland last week (Sept. 24-26). It was a terrific show, with over 650 quilts on display. A friend and I spent the entire day there, walking slowly up and down every aisle, admiring the quilts and enjoying the vendor mall. Really enjoying the vendor mall, if you know what I mean. Someone did not come home empty-handed. Those are very nice comments. I’m not sure what I was expecting — perhaps something about what I could have done better? I was very pleased to see that last comment because Loretta Orsborn, the longarm quilter who quilted Catch a Falling Star, did such an outstanding job. On the day I took my quilt to her studio, we spent three hours looking at designs and choosing motifs. She expertly combined digitized and free motion quilting. If you’d like to see some close-ups of her work on my quilt, you can check out this earlier post. It’s the center medallion of my quilt Catch a Falling Star, based on Terri Krysan’s Reach for the Stars star sampler quilt. During all of 2014 I was engrossed in making this quilt. Regular readers were with me each step of the way. I decided then and there to make a second version. Those two blocks were as far as I got, though. Now, several months after finishing Catch a Falling Star, I have returned to that idea. You must think I’m crazy. Or maybe just star crazy. Ah, but there’s a method to my madness. You see, I am not going to make the 14 blocks that surround the center medallion. My Version 2 of Reach for the Stars is going to be a bedrunner. I’m going to choose my six favorite blocks from the 14 I made for Catch a Falling Star. I replaced a couple of blocks in Terri Krysan’s quilt design for some I liked better, and at least one of those will wind up in my Version 2. Either I’m a committed quiltmaker or I should just be committed. What do you think? Thanks to modern technology, I made virtual friends last year with several quiltmakers who, like me, were enchanted with Terri Krysan’s star sampler quilt, Reach for the Stars, and decided to make their own versions. Directions for the quilt were released in serial form by Quilter’s Newsletter beginning with the Oct./Nov. 2013 issue. As each issue was released, our little band of quiltmakers would share our progress and cheer each other on. Last fall I began corresponding with Fawn S. of New York, who was working on two versions of Reach for the Stars — one as a birthday gift for her mother and one for herself. Several of the quilters in Fawn’s group, the Honey Bees, were also making RFTS. Now Fawn has sent me photos of quilts and quilt tops made by her and her quilting colleagues Rose, Linda, Nancy, and Janet. I am so happy to share those photos with you. 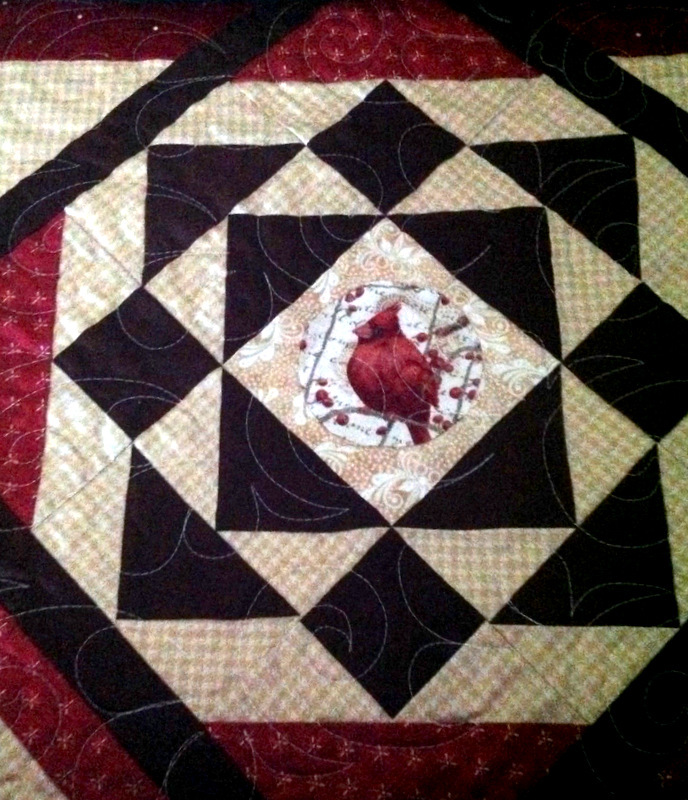 This quilt, featuring fussy-cut cardinals, was made with deep reds, tans, and browns. Here’s the center medallion . . .
Fawn quilted this herself on her mid-arm. Beautiful! Love the batiks. And did you notice the accent pillow? It features a different bird print than the one she used on her mother’s quilt. Can’t wait to see both of those quilts with the borders added. Rusts, corals, tans, and greens on a cream background — so striking. And the batik print in her checkerboard border sets off the inner fabrics beautifully. Thank you, Honey Bees of Honeyville, NY, for sharing your beautiful quilts with me! I hope seeing them inspires others who are also reaching for the stars to keep working on their own versions. My regular readers know all about this quilt. A year in the making, Catch a Falling Star is based on a design by Terri Krysan called Reach for the Stars that was offered in Quilter’s Newsletter over the course of seven issues, beginning with Oct./Nov. 2013 and ending with Oct./Nov. 2014. Using my own color scheme, which is quite different from the original, I replaced three blocks and made a few changes to some of the other blocks. I also challenged myself to incorporate a fussy cut image into every block and redesigned the border to make it symmetrical. The Jacobean floral fabric and a few others in the quilt are from the Ainsley line by Northcott Fabrics. The remaining fabrics came from my stash. Many of my blog posts in 2014 are about the creation of this quilt. If you are interested in seeing how it came together, block by block, simply click on the “reach for the stars sampler quilt” link at the bottom of this post. All of the posts will come up in reverse chronological order. In particular I hope you will look at some of the close-ups of longarm quilter Loretta Orsborn‘s beautiful free-motion and digitized quilting designs. My quilt is entered in the large quilt category. To see some of the other large quilts entered in the festival, check out this link: http://amyscreativeside.com/bloggers-quilt-festival-large-quilts/. But wait, there’s more! There are 10 other categories of quilts in the festival: mini, small, appliqué, art, hand quilted, home machine quilted, original design, ROYGBIV, scrappy, and viewer’s choice. Be sure to check them out. And prepare to be inspired!